For Scrum Masters, holding a SAFe ASM certification will tell employers they are committed to excellence in practicing in a SAFe environment. 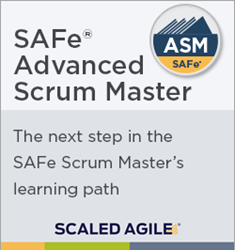 Scaled Agile, Inc. (SAI), provider of the Scaled Agile Framework® (SAFe®), today announced the launch of a new certification: SAFe Advanced Scrum Master (ASM). The two-day course was created to meet the growing demand from Scrum professionals looking to develop expertise in SAFe and meet the demands of enterprises relying on SAFe to build better software and systems. SAFe ASM prepares Scrum Masters to take a leadership role in facilitating Agile team, program, and enterprise success in a SAFe implementation. They will learn facilitation of cross-team interactions in support of program execution and relentless improvement. The course will enhance their understanding of the Scrum paradigm with an introduction to scalable engineering and DevOps practices, and the application of Kanban to facilitate the flow of value. It will also provide them with a consistent approach to facilitating interactions with architects, product management, and other critical stakeholders in the larger program and enterprise contexts. With this new addition, Scaled Agile now offers a portfolio of six professional credentials designed to meet the needs of Lean-Agile professionals from the very beginning of their learning path through their veteran years as they practice, consult, and train others in SAFe. Public classes are being held in multiple cities, including Boulder, Philadelphia, Santa Clara, Washington, DC, and Atlanta. Information about the course can be found at scaledagile.com/safe-asm. Registration details and public course calendar can be found at scaledagile.com/calendar. Attendees of the SAFe ASM course are strongly recommended to have one of the following certificates: Certified ScrumMaster® (CSM), or Professional Scrum Master (PSM). Alternatively, SAFe Practitioners (SPs) who have attended the SAFe Scrum Master Orientation may also attend. Based in Boulder, Colorado, Scaled Agile’s mission is to help large enterprises achieve better outcomes, increase employee engagement, and improve business economics through adoption of Lean-Agile principles and practices based on the Scaled Agile Framework® (SAFe®). SAI supports tens of thousands of practitioners of the Framework through training, certification, consulting services, and a global partner network that reaches over 35 countries and 350 cities. As a contributing member of the Pledge 1% corporate philanthropy movement, SAI also seeks to inspire, facilitate, and encourage other companies to make a positive impact in their community. Learn about Scaled Agile, and the Scaled Agile Framework, at scaledagile.com and scaledagileframework.com.